Molecular Biologist and Assistant Professor of Biology Dr. Chris Barton has led groups of students across Belmont’s campus through extensive research projects related to the behavior of cancer cells. Interested in identifying drugs that could stop the growth of these cells, Barton has been working within cancer molecular biology for the majority of his career and says he’s happy to carry a version of that work with him to Belmont. Thanks to a semi-sterile tissue culture facility in the Janet Ayers Academic Center, students can engage with research in a hands-on way. Currently, student groups from Barton’s Cell Biology class are working to grow cancer cells that have been isolated from tumors in plastic dishes. These cells live along the bottom of the plate as students watch them grow, move and divide. Throughout the semester, students learn a number of techniques that assist in their work. As the semester begins to close, students have the opportunity to spend time in lab facilities finalizing their work. 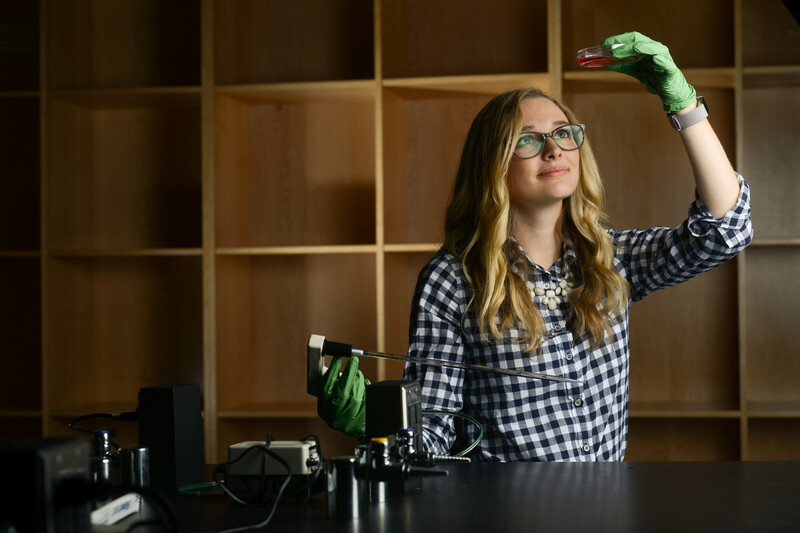 Senior biology major Bailey Bergmann is one of Barton’s students and has been working on understanding the affects of certain drugs on colon rectal and lung cancer cells — specifically, what will stop them from growing. After reading an article in the New York Times about the effects of Chloroquine, a medication, on cancer, Bergmann sought out to begin her own work. She began studying Amodiaquine, another medication, and found that it had quite an impact on the cells’ viability — in fact, it causes cells to stop dividing and die. She has continued to develop and expand her research question since beginning her time in Barton’s lab last summer. In addition to his students throughout the school year, Barton has also led a number of groups through Belmont’s Summer Scholars program, an opportunity for students to stay on campus throughout the summer, working alongside a faculty member on a specific research project. Barton’s teams have used the same model of growing cells in culture. After exposing the cells to a number of molecules, students use various techniques to analyze whether specific drugs affect how the speed, size and lifespan of cell. Additionally, students can even isolate which genes have been turned on or off in certain cell after they’ve been exposed to drugs.